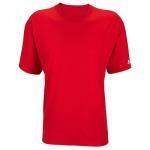 The benefits of our HeatGear® Full T in a versatile v-neck. Designed for reliable moisture transport and comfort. ArmourBlock technology eliminates odor causing microbes. 81% 4.5 oz PolyArmourTM/ 19% Elastane.